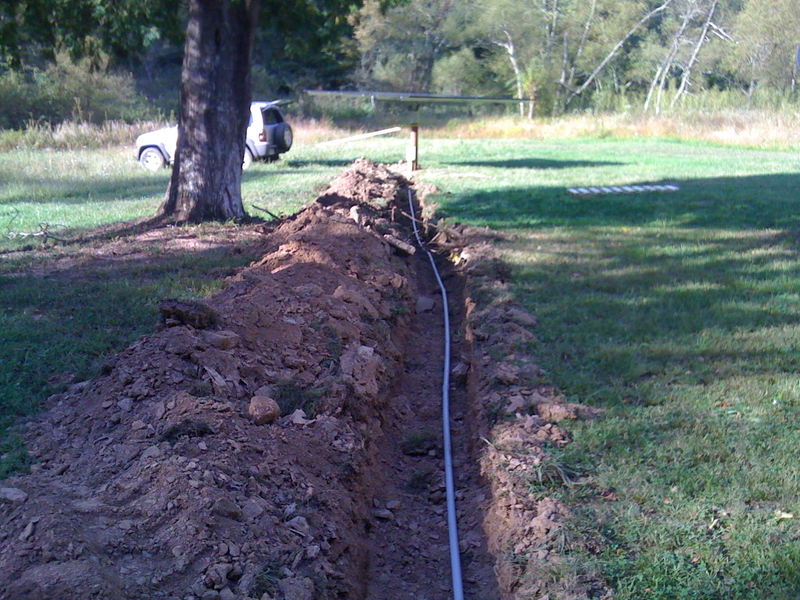 Once we finished installing the 10” steel pipe install for the pole mounted PV panels we next had to get the wires buried. I got a local guy to bring his Kubota back-hoe over to dig a trench from the pole to the electrical room. We then put it in 1” electrical PVC pipe to protect the wires. We pushed several of the 10 gauge cables through as fast as we could and was finished in time for him to grab his John Deere lawn tractor to start back filling. 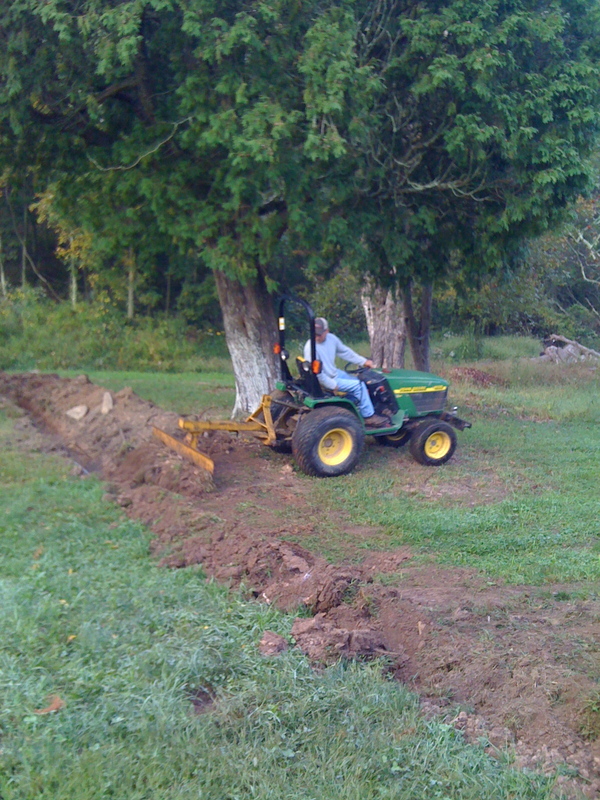 We then had the Kubota (with a back hoe) dig out a spot out over near the mud room for the future root cellar we plan to have blocked up in the Spring. Just when he was finishing up his front wheels dropped down in a water drain ditch and ripped off his hydraulic filter and within seconds all the fluid was lost. That is why he had to use the John Deere to finish up. 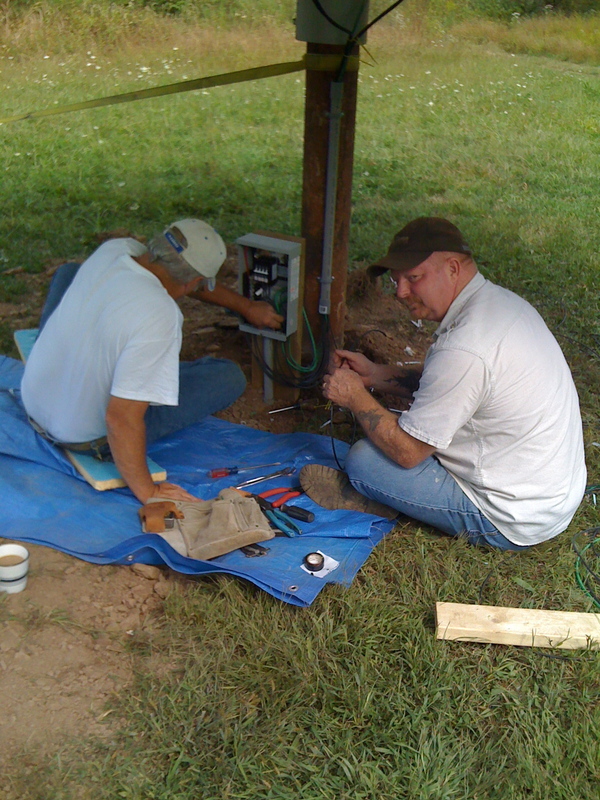 The next day John and I finished connecting the PV panels, grounded each and connected it to the recently pounded in 9′ grounding rod. 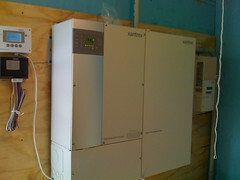 We then connected 3 PV panels per bank in a series with their MC connectors. There were a total of 4 banks. Next we put a 3’ piece of 2×6 in the ground and mounted the Midnite Solar Combiner disconnect box to it. Installed 5 of the 1/2” strain reliefs in the bottom of the disconnect box for the ground and the 4 banks. After doing a lot of searching on the web I finally arrived at the Alternative Energy Store aka AltE. I called their tech support and was happy to find that they had no issue with spending the time helping me understand what the major components did in the system. I wanted to over engineer my system to allow me to grow into it. Originally discussed one of their pre-packaged systems but as they educated me and I gained a better understanding of how a PV system was suppose to work I began asking more questions. I wanted to make sure I could add additional components such as a Micro-Hydro or a Wind Generator down the road without being told “Oh you can’t do that with this system”. I finally decided on a Xantrex 2.5kw system that includes the Inverter/Charger, Charge Controller, two banks of 8, 190 Amp-Hour 6V batteries, Automatic Generator Start (AGS) and distribution panels. There are also tons of cables and connectors with the system. The PV are 12, 205W Kyocera solar panels, mounted them on Top Mount configuration. When I ordered my batteries for the solar system the company recommended that I use a 48 volt setup. 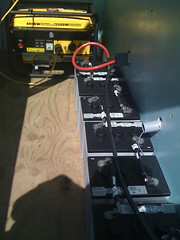 I then purchased eight 105 amp AGM 6 volt batteries and connected them in series. A few weeks later we decided to get a second identical setup and connect them in parallel. This configuration still gave me 48 volts but with twice the amperage. 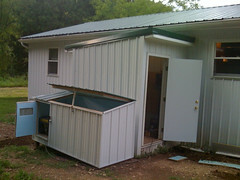 I had originally put a “Battery Room” next to the “Electrical Room” (as pictured) and vented it for safety. As it turned out, the AGM glass mat gel batteries do not “off-gas” which means that I could have put them anywhere I wanted. We still put them in the Battery room and now also store the backup 3500 watt Champion generator in there as well. More on the primary Guardian Whole House Generator later. For us living off the grid isn’t about catching a ride on the green movement wagon. It’s about being self sufficient and living in a more simple, if not humble life style. That in it’s self will help lessen the burden we put on our world resources. It is a dream that my husband Sonny and I have wanted to achieve, but sometimes life pulls you into an opposing direction. When we were first married some thirty odd years ago we moved from place to place in search of cheaper rent that would give us a few more dollars to live on. In 1982 when Sonny joined the Navy we moved every two to three years, never setting down roots. Of course we fell into the river of “Gotta Have” and the swift current sent us directly to the sea of debt. We had lost sight of what was most important to us. Sonny retired from the Navy in 2003 and immediately started a job with a major company allowing us to live off the fat of a large paycheck. Suffice it to say the shininess soon wore off. I became concerned with the level of stress Sonny had to deal with on a daily basis and watched as it affected his health. Besides that, being a country girl at heart the city was stifling me. It just wasn’t worth it. So in 2008 we began looking for property. We both love the mountains, particularly the Shenandoah Valley of Virginia or the Eastern part of West Virginia, but land was to pricey in those areas. So I visited my cousin who lives in the Northwestern corner of West Virginia. 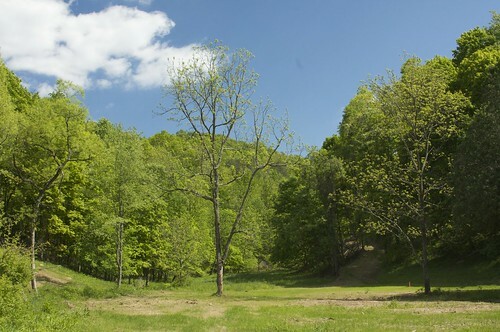 We were able to find 70 acres of beautiful raw land within our price range. We were back on track to attaining our original dream. The home we built is comfortable and has everything we need. This Spring we plan to grow our garden and build a root cellar. The next step will be to get a few chickens and guineas as well as some goats. We may even try our hand at bee keeping. I hope that you will join us as we take this journey. Maybe some of our ideas will help you reach that dream of freedom and self sufficiency. 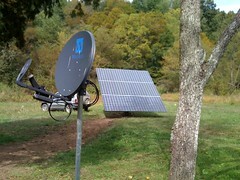 You are currently browsing the Off-Grid in West Virginia blog archives for February, 2010.